Our Best Barn's New Castle wood storage shed kit is 16 feet wide on the door side and 12 feet deep providing an enormous storage space! 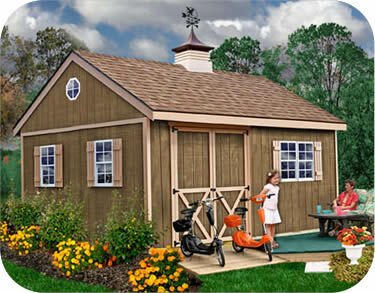 Our Best Barns New Castle storage shed kit is perfect for all your storage needs! 16 feet wide on the door side and 12 feet deep provides an enormous storage space. 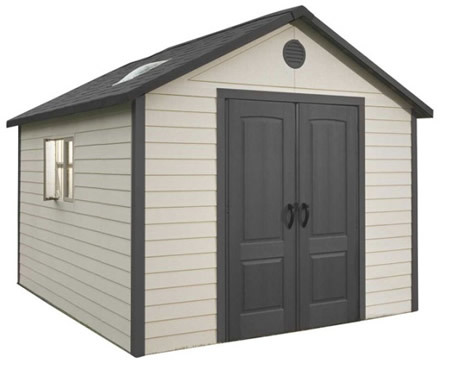 This shed is big enough to drive your riding lawn mower into and still have plenty of room to fit the rest of your garden tools and yard equipment inside. The wide door opening provides 5' 4" of clearance to ride even atv's through! 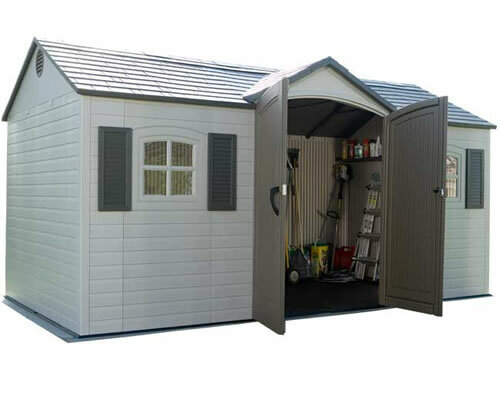 Having the doors offset to one side of the shed will allow you to have a large storage area on the other side. Don't settle for anything but the best quality from Best Barns! Best Barns has been producing quality storage buildings for 30 years sold in home centers across the USA and Japan. 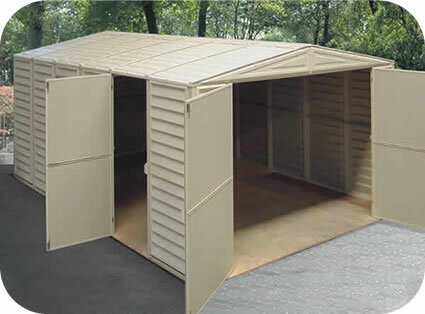 What is the difference between the EZup Sheds and Best Barns sheds? 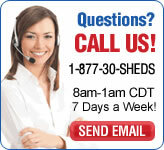 Best Barns offers you added savings for just an extra 2-3 hours of your time. In addition to your shed delivery, with the Best Barns the siding, roof sheathing and loft (if included in kit) will be delivered separately from your local home center; usually Home Depot. The customer will then follow the instructions to make only straight cuts to prepare these. Best Barns makes it inexpensive and easy! Doors are assembled and ready to hang! Door hinges, latch, hurricane straps for trusses, nails, glue for gussets, detailed instruction manual and all hardware included. Shingles and roof edge provided by owner / not included. *Shed pictured with 4 optional single hung windows with shutters, Add below! 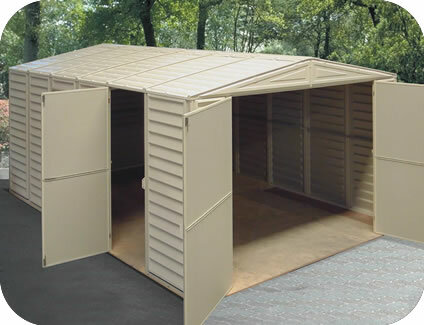 The wood flooring system is the perfect addition to complete your new shed kit. 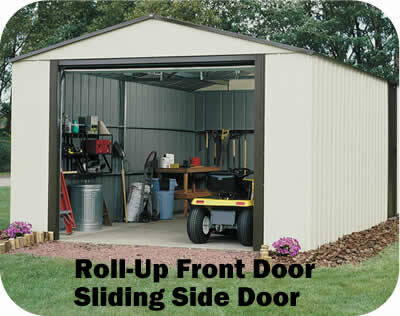 Easy to construct and designed specifically for your new storage shed. Our Wood Floor Storage system provides a dry storage area, easy to construct and raises the shed above the ground to prevent damage from water and ground moisture. 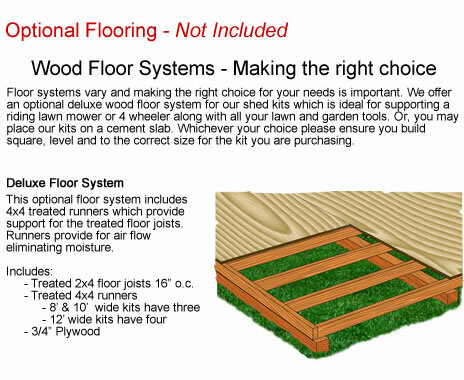 -Deluxe floor kit includes: 4x4 treated runners, 2x4 treated joists (spaced 16" on center), 3/4" Plywood flooring and nails. The extra 4x4 runners add additional support to the floor joists and allows you to build your storage building directly on the ground or grass. The 4x4's raise the foundation above the ground for air flow to help eliminate moisture. Flooring material is not pre-cut and will require the customer to make simple straight cuts. 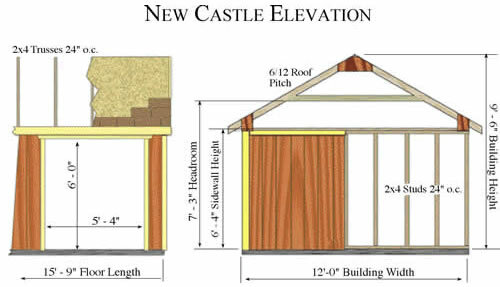 The floor package will be delivered before your shed kit locally by a lumber dealer (Home Depot will be used if available). They will call to make delivery arrangements and someone 18 years or older must be there to receive and sign for delivery.